This is for the PTI challenge today to borrow a color combo from Dawn. So I chose chocolate, aqua mist, and lemon tart. I really like how these colors worked here! I wanted smaller rhinestones for my row, but I had to make do with these big ones. Thanks for stopping by, hope your weekend is going swimmingly! Very, very pretty! I adore the colors and the big bling at the bottom is perfect! Very pretty card!! 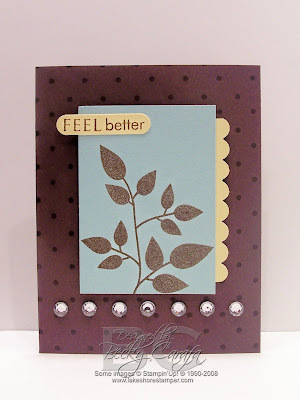 Great idea to add bling, I love those colors you chose too! This is so simple and cute. Great job! Such a pretty card, Becky!! It's the color of my daughter's room!! I love all the pretty rhinestones that you added!! The layout is fabulous too!! Awesome job! !